As a “new-ish” mom myself (15 month old daughter + one on the way), The Very Hungry Caterpillar by Eric Carle feels extra near and dear these days. Of course I remember it from my own childhood, but Macy already loves it too… and there’s just something so fantastic about seeing your kid’s face light up at the very sight of a book! “The Very Hungry Caterpillar by Eric Carle is my daughter Ella’s favorite book, so it was the perfect, sweet theme for her 3rd birthday party! The great thing about this party theme is that it can be done on a very small budget. Colorful fruit was a large part of the table display and the food labels were made by scanning the characters directly from my daughters book and creating simple tags using toothpicks to hold them in place! 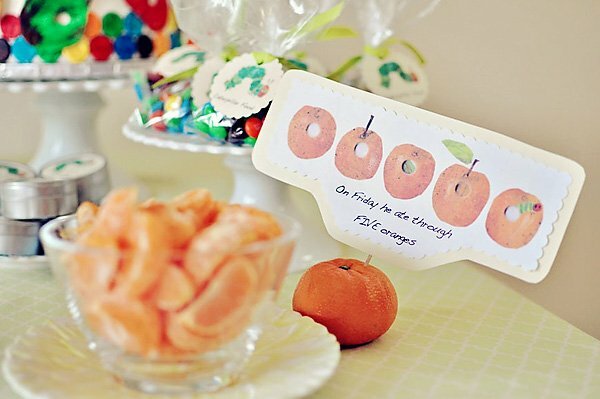 Whole pieces of fruit made the perfect stands for the tags, which narrated the caterpillars food choices across the party table. The tablecloth was simply a 2 1/2 yard cut of fabric with serged edges. I bought the lemonade dispenser at my local Hobby Lobby and the colorful cardboard straws were an etsy find. Each child was given a tin of Caterpillar Food (aka M&Ms) to take home. 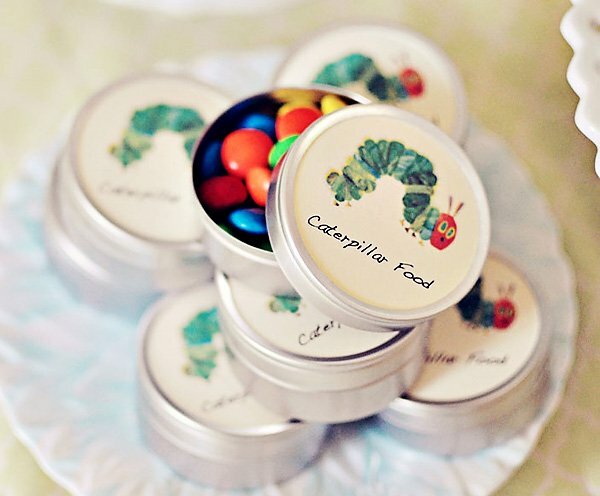 The tins were actually leftover from my own baby shower (the same ones can be found here), and I created the labels by printing the Caterpillar on card stock and punching the circles out with a circle punch that can be found at any craft store. 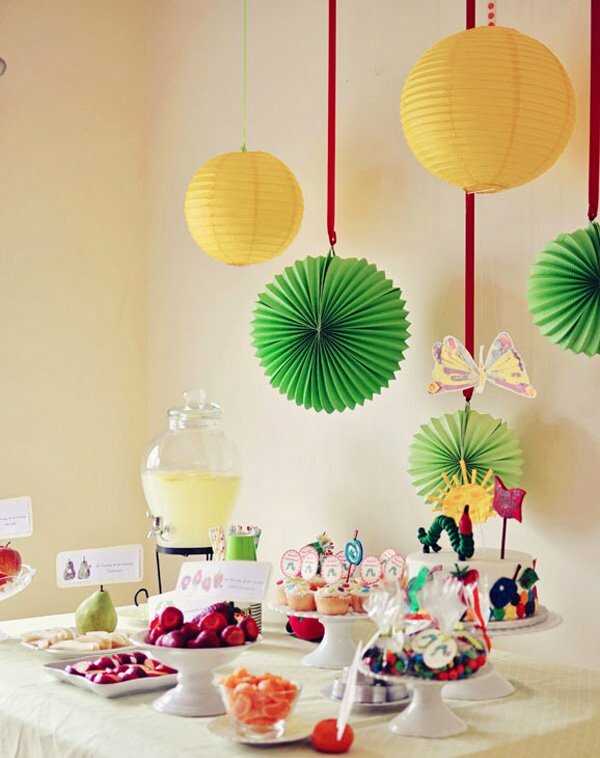 The yellow paper lanterns above the party table were purchased at Hobby Lobby and the green ones were found at Amazon. The incredible cake was made by a friend of mine! Beautiful job! I love the smile on her face! She is adorable! The cake is awesome! Thanks for sharing! This seems so accessible – not only to recreate but for the kids attending. Kudos. So simple and lovely. I agree with the above post – so accessible. I love this book and so does my little guy. The food details are too much! This is fabulous, what a great way to work the fruit into the theme. I’m more than smitten! This is really cool. Wow! I love this table!! 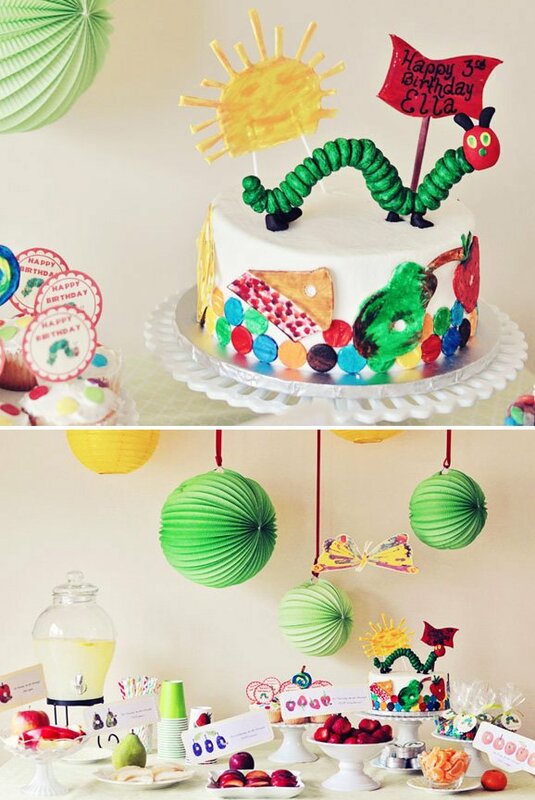 This theme this so near and dear to my heart–my son’s first birthday was also inspired by The Very Hungry Caterpillar. Very creative! A healthy alternative to a dessert table, love it! Totally adorable! Will save this idea! Would be super cute as a baby shower too!! SO ADORABLE! we love Eric Carle in my house… that cake is stunning… so authentic! So sweet. Love the cake. The food labels are great! The cake is wonderful.. and of course so is the book! Thanks for the great post. So sweet! The cake is fantastic. Hana’s daughter is adorable and I love her dress! 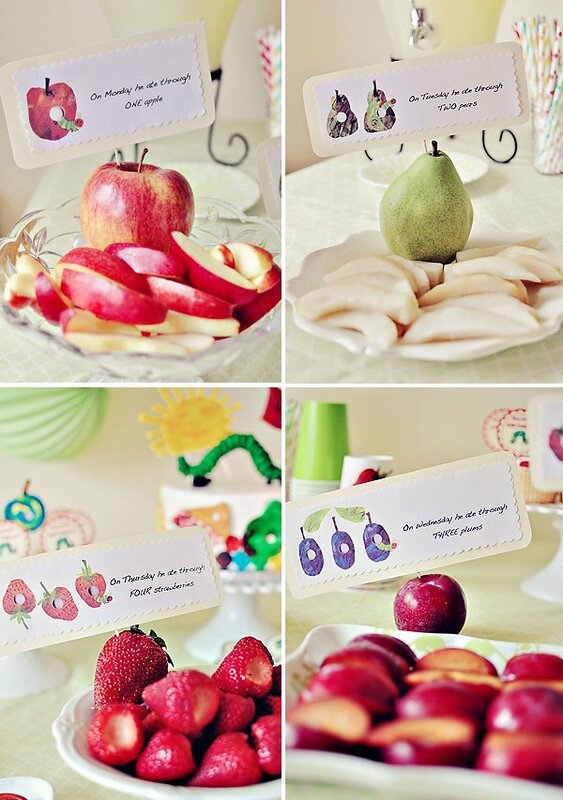 This is a perfect party to show our children that fruit is a fun food. The colorful table and decorations are perfect! Fabulous! Fabulous!! Love every inch of it!! Stunning photos too! Can you share how the caterpillar atop the cake was created? Awwww, what a beautiful birthday party! All of your stuff is beautiful. . so creative and beautifully displayed! Great photography too:) You give me inspiration to throw my best friend a wonderful baby shower for her twins on the way! did your friend stick real pictures from the book on the cake? and how? This is such an awesome idea and such lovely colors and food ideas. I will be doing this for my own hungry caterpillar’s first birthday later this month. Thanks so much for the help, ideas and inspiration! Hello, I’m planning to throw my daughter a Very Hungry Caterpillar themed birthday and I was wondering where you purchased the tags and labels for everything. If you could please e-mail me with the information, I would greatly appreciate it. Help! So want to do this party for my little girl! Also as a once kindergarten teacher this is awesome! Where do I order the stickers to put on top of the tins and where do I order the fruit signs? Thanks!!! Thanks for all these GREAT ideas! I am having a BabyShower for my DIL…and this is going to be the theme! Can’t wait to get started! Thanks again! I LOVE the entire party, looks amazing. I really admire the food labels that you did, and have been looking to do something very similar for my little ones first birthday. Where did you get the graphics or how did you do them? Hi, I made the food and candy labels myself by actually scanning the graphics from my daughter’s book and adding wording in photoshop. What a great party. Thanks for all of the inspiration for helping me plan my son’s VHC party too. Check out my blog for pictures. I LOVE your ideas! I am having my son’s first birthday party at the end of the month and plan on doing this theme. I am having a difficult time finding labels for the food. Yours are adorable! Where did you find the story to print the labels? Was it online or scanned? If you have the file, would you mind sending it to me via email? How did your friend make the caterpillar that sits atop the cake? And was it edible? Love all you did! Could you tell me where you got the pictures for the “On Monday he ate through one apple…”. 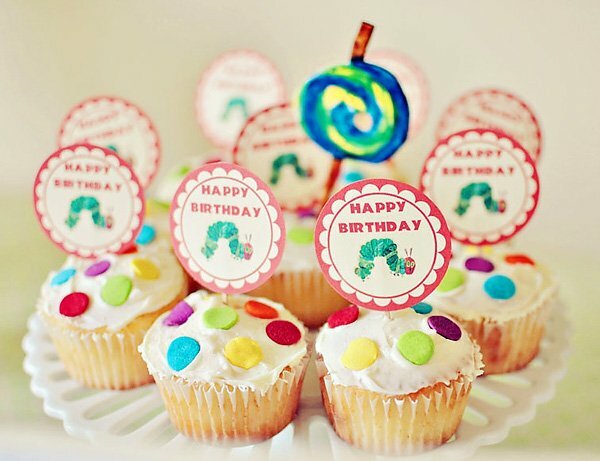 I am trying to do this for my son’s first birthday party and am having a hard time finding such great pics. Thanks! loved the fruit tags on the table. where did you get those from? 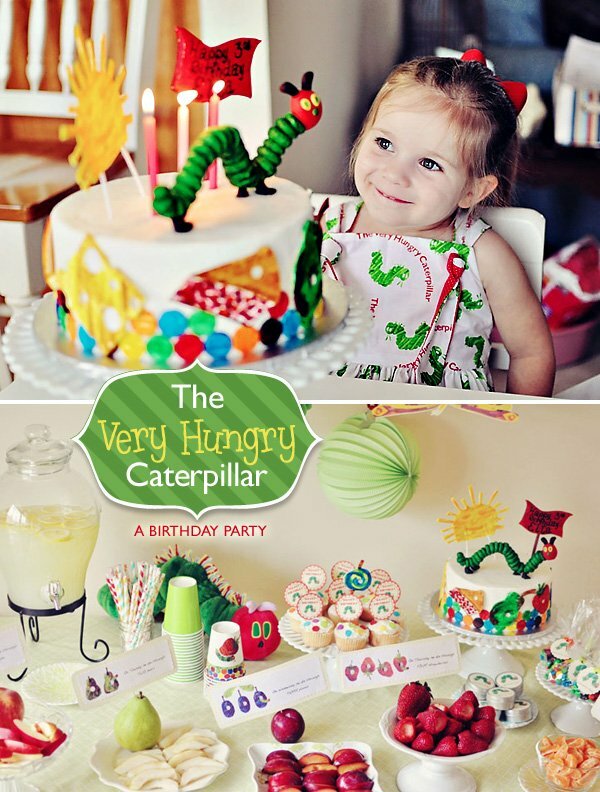 This is my favorite Hungry Caterpillar party that I’ve seen online! You always have the best ideas! Can you tell us how you scanned the book to make the tags? Did you use Photoshop? I’m not very tech-oriented so I need help! Is the cake all fondant? She did a wonderful job!